Once the hundreds of thousands of volunteers who had rushed to join the British Army were allocated to their various regiments and corps and trained for war, so the size of the British armies on campaign overseas swelled in numbers. 1/4th, 1/5th and 1/6th Territorial battalions of the Gloucestershire Regiment were the first to join the two Regular battalions, landing in France in March 1915. Soldiers of the New Army, in 8th, 9th, 10th, 12th and 13th Service battalions followed the Territorials into France, and on 11th July 7th Battalion landed on the Gallipoli beaches. The Gallipoli front had been opened as a result of the Royal Navy’s failure to clear the passage of the Dardanelles Strait, dominated as it was on either side by Turkish shore-based artillery. The landings made in April had secured for the Allies a precarious foothold on the Gallipoli peninsula, and both sides had sustained heavy losses. 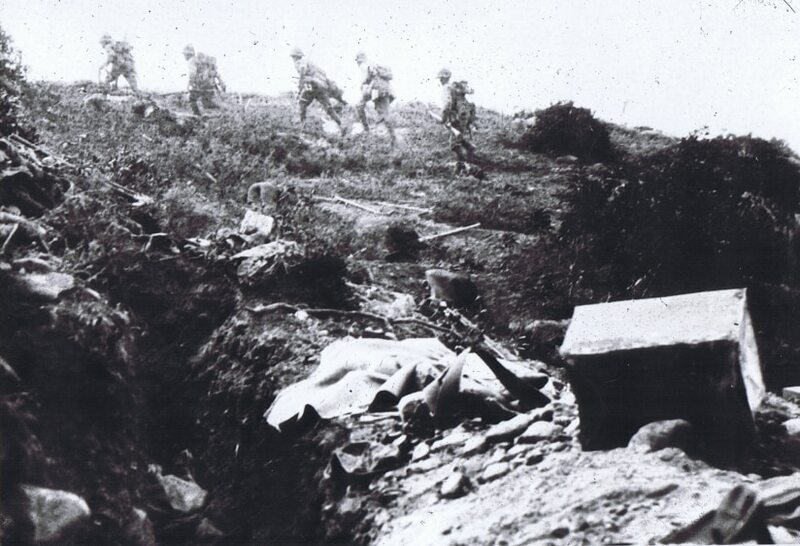 7th Battalion, The Gloucestershire Regiment saw its major commitment to battle in the attempt to take the hill of Chunuk Bair, just inland of Anzac Cove. On 7th August the battalion went into battle almost 1,000 strong, but only 181 emerged from it completely unscathed, the rest being either killed or wounded. Of the battalion’s twenty officers, ten were killed and ten were wounded. “The big attack took place on Sunday morning. As soon as day broke we had orders to rush for the ridge, about 600 yards away, in extended order, and this we did amidst a hail of shrapnel. Our orders were to extend out two yards, take all possible shelter, and one man was to dig and the next one to open fire on the enemy who were about forty yards away. “It was my duty to follow out the firing order while my companion was digging. I was struck in the face by shrapnel early in the attack and my wrist was shattered. With some 250 Australians [actually New Zealanders], Ghurkas, and Gloucesters, I remained in the gully until eight o’clock in the evening, shells continually bursting in the vicinity. 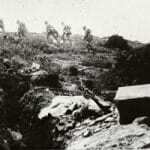 Chunuk Bair remained in Turkish hands. “Am in a dug-out in the firing trench. Came up last night and was sent with my men to dig a new communication trench in the dark. Boring performance, as they sniped at us in the moonlight all night. Got the men back to the trench at 2 a.m. went to sleep – very smelly – four dead Turks found buried in the corner! We buried over 30 in front of the communication trench last night. . . . This morning had such a good breakfast, as Pemberton (machine gun officer, Warwicks), who is with me had some rations – bacon and jam – which he shared with me. By 17th October the Royal Gloucestershire Hussars were down to an effective strength of 95, all ranks, with battle casualties and, more decisively, disease, having taken their dreadful toll.